Since making Aliyah to Haifa from the United States in July of 2009 with my wife and three children, I have given thousands of chiropractic spinal treatments to Israeli patients ranging in ages 2 weeks to 95 years. I have seen enough x-rays, CT scans and MRI’s to tell you that in my 20 years of practice I have never seen the degree of spinal damage as I have seen these past four years, especially amongst the younger population. Patients in their early 20’s are showing up in my office with spinal damage that usually occurs with normal aging in the 40 to 50 year old group, including damage to the cartilage (the discs) between the spinal bones that give stability to the spine, act as shock absorbers, and protect the nerves. Many patients experience radiating pain from the spine to the arms and legs and spinal degeneration problems which are normally seen in the later years in life. Many people are taking pain killers on a daily basis, which have undesirable side effects, and frequently miss work due to the pain. Besides the financial loss involved, this also leads to significant mental and emotional stress. I keep hearing the same thing from many of my patients: “I never had any back problems until I got out of the military.” Although not all patients that I have seen have suffered spinal injuries due to military service, an alarming majority of them have. There is no question that the physical, mental and emotional stress one has to endure in service is causing damage. The long hours and heavy backpacks that soldiers are required to wear during training put abnormal pressure and stress on the spine that lead to injury. Headaches, migraines and insomnia are also symptoms of possible injury to the neck. These two x-ray images of the low back show the difference between a healthy spine (Fig 1) and one with spinal damage (Fig 2). The healthy spine has wide spaces (the dark spaces) made up from normal spinal discs between the spinal bones (the white square shaped areas) that cushion our back, act as shock absorbers and protect the spinal nerves. 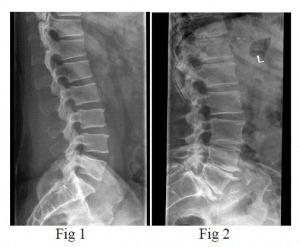 The damaged spine shows a decrease in space between the two lower spinal bones from damaged, flattened, dried out discs. In my practice I see children between the ages of 10 to 17 that complain of neck and back pains that are not normal for this age group, unless there is a congenital spinal deformity or if the child was involved in an accident. Your spinal discs are mostly water and will dry out and break if you do not drink enough. Early signs of disc damage in an MRI show up as a loss of water in the disc. To determine how many liters you need per day, divide your weight (in kilograms) by 30 (ex. somebody weighing 70 kg is going to need 2.3 liters per day). You’ll know your body is well-hydrated if the color and odor of your urine is neutral. Drinking carbonated drinks in place of water damages your spine over time. The phosphoric acid in the soft drinks stimulate your body to remove calcium from your bones in order to balance the abnormal acid build up in the blood. This weakens your spine and leads to future problems. Soft drinks, coffee, juices and flavored water are NOT replacements for the real thing! 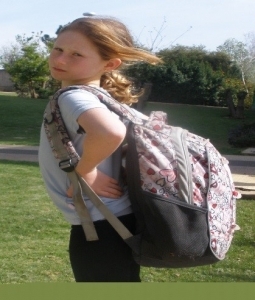 Make sure your child’s backpack weighs no more than 15% of their body weight. Buy a backpack with wide shoulder straps. The backpack should be worn in the upper to middle back. Buy a backpack with a waist belt, if possible. If your child complains of neck pain, back pain or headaches, don’t ignore them. Get them checked immediately. Make sure your child drinks enough water. If you experience symptoms of spinal injury that I already mentioned, don’t ignore them. Get yourself checked. Although taking pain medication may help you feel better for a short while, unless the root of the problem is corrected, you may suffer damage to your spine that will be difficult to fix in the future and may affect your quality of life in the long term. Dr. Jacob Hans is a family chiropractor trained and Board Certified in the United States. He is also a member of the Israel Chiropractic Society. Dr. Hans specializes in treating problems of the spine. You may reach him at his Haifa clinic on the Carmel at 054-940-1289.
https://www.drjacobhans.com/wp-content/uploads/2016/05/why-is-my-back-hurting-me.jpg 533 800 Jacob Hans https://www.drjacobhans.com/wp-content/uploads/2018/05/DrHansLogo.png Jacob Hans2014-04-12 14:42:182018-11-25 14:01:48Why Is My Back Hurting Me?